“The age of iron has no other seal than that of Death. Since the publication of my book, Mysteries of the Great Cross of Hendaye: Alchemy at the End of Time, I have received many emails from around the world. Most of them are well intentioned and thoughtful, but very few of those writing have mentioned the many – and obvious – other clues embedded in the Cross that I have never mentioned. In his book, Fulcanelli tells us that the Cross of Hendaye is the most important monument that he has ever seen. He writes that the Cross cross shows us the exact moment when the end of the age – the end of Time – will occur. Wanting to know everything that I could about this odd monument, I’ve now spent over twenty years investigating and researching it.The overt conclusions I’ve come to are in my above-mentioned book but can all essentially be boiled down to this: The end of this Age – the end of this Time Period – will be one where the human race will be put through a terrible trial by fire. The time period for this massive event in human history stretches between the years 1992 and 2012. About two weeks ago, I received an anonymous email from someone who calls himself ‘Syphon.’ This unknown writer is no ordinary emailer. He is obviously a learned man who knows his Latin and Greek, as well as French and English. He was well versed in the lexicon of alchemy and quite familiar with many prophetic traditions…running the gamut from Nostradamus to Li Chunfeng. Without getting too deep into the details, Syphon had prepared another interpretation of the Latin inscription on the Hendaye cross that seemed to have a great deal of credibility. (When all will) perish and be destroyed. “ Hecatomb” is a Greek word for sacrifice or slaughter. Now we have two separate prophecies, both from the southern France region, both written within fifty to a hundred years of each other and both making very similar predictions. They are too close to each other for comfort. Hopefully, none of this will come to pass any time soon, but just in case we are onto something, here is my interpretation. There is going to be a sacrifice, near the time of Autumn. Many will be slaughtered. “The year of the seventh number” could be 2007. “The games of slaughter” could be the Olympics now going on in Beijing. “Not far from the great millennial age” can only mean the year 2000. What is also interesting about quatrain 10/74 is that it is only two quatrains away from quatrain 10/72 – Nostradamus’ famous quatrain about the ‘King of Terror’ coming from the skies in September of 1999. We now know that this did not come about in 1999, leaving many Nostradamus fans in a quandary. However, world-renowned Nostradamus scholar John Hogue has come up with an explanation about quatrain 10/72 that makes perfect sense, and shows that, once again, Nostradamus was right. Nostradamus never puts a date as exact as this in any of his other quatrains. Many experts believe that because he placed an exact date on this prophecy that this was an indication of the importance of this quatrain. But when 1999 came and went everyone wondered how Nostradamus could be so wrong. But things are not so easy when it comes to Nostradamus. 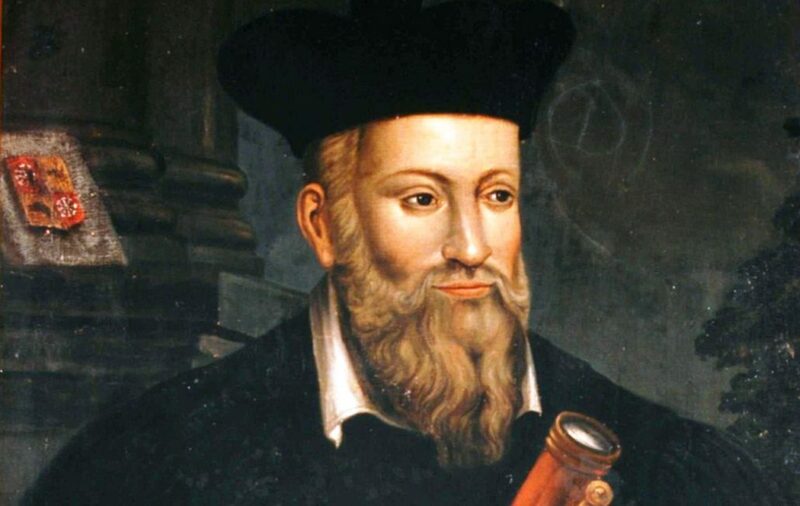 One thing that all experts agree upon is that Nostradamus did not want anyone to know about an event he predicted before that event occurred. Nostradamus apparently wants you to see that he was right only *after* the event occurred. This same line of logic applies to quatrain 10/72. Nostradamus was not wrong in quatrain 10/72. He was only misinterpreted. Again, holding true to the logical pattern in Nostradamus’ work, no one would get the right interpretation, until after the event occurred. This holds for quatrain 10/72 also. John Hogue has now shown that Nostradamus was right once again. But one can only get the date right by inverting the numbers of 1999. When one inverts the number 1999 it comes out to 9111…or September 11th, 2001. Even the number of the quatrain,10/72, gets into the act. Remove the seven (which is Sept) and you are left with the three numbers 201. The year that the quatrain took place was 2001 so even the quatrain’s number is making you aware of Sept 2001. Is this current interpretation of the Latin Inscription on the cross of Hendaye correct? Is Nostradamus’ quatrain 10/74 about to occur? We probably won’t really know until after the event has happened. Soon, there will be four US Navy Aircraft Carrier task forces in the Persian Gulf, presumably to stop Iran from blocking the Straights of Hormuz should it be attacked by the US or Israel. However, it’s hard to see why Iran would block the only tanker route it uses to deliver its oil and gas to foreign customers. We appear to be on the brink of yet another major War and no one seems too interested in attempting to stop it. The New York Times recently published an editorial by Benny Morris of Israel, calmly telling us that Israel had the *right* to use nuclear weapons to incinerate Iran and kill its 70 million inhabitants. As with all prophecy, we won’t know if these terrible predictions are true until after the events occur…if they do. There is one thing we can all agree upon, however: the situation in the world is looking increasingly precarious as the Olympic games continue. Let’s hope the prophecies quoted above are just tricks of words and of the mind. Otherwise, we may be heading into a War where untold millions could perish.